Team-based gaming can be extremely irritating, especially when you meet certain individuals who just can't seem to work along and co-operate, or, if you meet someone like Kevin. Acting like a total noob who randomly fires at every single corner and every single teammate, being completely ignorant about what anyone says, and sealing the deal by ultimately rambling on and on in-game about absolutely nonsensical stuff, you can say having someone like Kevin on a team is simply a pain to game. But it's all just for the fun, isn't it? 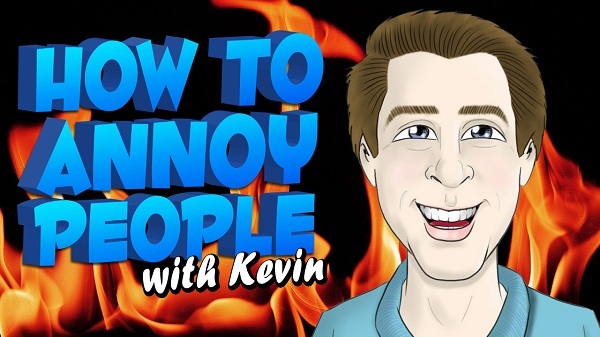 and that's what makes How to Annoy People with Kevin so hilariously epic. It's weekly-episodes shows how while playing titles from the Call of Duty series, he deliberately annoys other gamers who weren't playing seriously, found it funny or, well, some people who became really not so friendly. But being the ignorant Kevin, he continues to ramble on and on and literally following them everywhere you simply just cant stop laughing . Sometimes also known at an IGN of TeamLeader1811, you'll learn that the easiest way of annoying people is trapping them, of course. "So much for a team leader, eh?". Garnering over 62.4 million views over the past 2 season already, and having more than a million views for about each videos from the series, How to Annoy People is evidently popular with its strong fan base. And even after about 2 years on since the last season, its following remains consistent as Machinima has recently announced with a trailer that How to Annoy People will be back with a Season 3 on Machinima Respawn, starting 13th of January! Here's to the start of a whole new season!